The Pine Tree State is the latest to grapple with the risk of an unusual adult-onset allergy to red meat, CBS affiliate WGME-TV in Portland, Maine, reports. The culprit is a small arachnid: the lone star tick. Griffin Dill, a pest management specialist with the University of Maine Cooperative Extension, said reports of this species are not new, but the the number of sightings seems to be increasing. "What we're trying to figure out is if we have any stable breeding populations," Dill told WGME-TV. The ticks are known to live in nearby Massachusetts and Connecticut, so he believes it's only a matter of time before they settle in here. The Centers for Disease Control says the species ranges across much of the southern and eastern U.S.
"We have a had a couple of instances we know of of people coming down with this meat allergy in the state of Maine," Dill said. "It's still this big question mark about whether they were bit by a lone star tick here in Maine or if it was travel-related." The are linked to a strange symptom in a small number of people who are bitten: they suddenly become allergic to eating red meat. "In order for the ticks to cause this allergy, they have to first feed on a different type of mammal in a previous life cycle to pick up a specific carbohydrate that's in all mammalian cells other than humans and apes," Dill explained. According to a recent study in the Journal of American Medicine, the allergy is specifically to alpha-gal, a type of sugar found in many red meats including beef, pork, and lamb. While the alpha-gal allergy is considered rare, this could be at least partially due to underreporting. Research shows that unlike typical allergic reactions that occur within a half-hour of exposure to an allergen, alpha-gal reactions can take three to six hours to manifest. Their severity can also be misleading: victims who wake up suffering from alpha-gal symptoms ranging from severe stomach distress to anaphylactic shock have good reason to not know what hit them, and even medical professionals are prone to misdiagnosing the unusual affliction. As allergic disease specialist Dr. Dean Metcalfe told researchers: "If you start to have trouble breathing in the middle of the night, you probably aren't going to blame the burger you had for dinner." The red-meat allergy isn't the only ailment spread by the lone star tick. Last year, Mainers reported 20 cases of ehrlichiosis, a bacterial illness that can cause flu-like symptoms and difficulty breathing, up from just four cases the year before. There were also three cases of Rocky Mountain spotted fever, which in severe cases can lead to limb amputation, hearing loss, paralysis and mental disability if left untreated. Research is ongoing, as scientists do not understand why some with a history of exposure to lone star ticks are resistant to the allergy when others are less so. 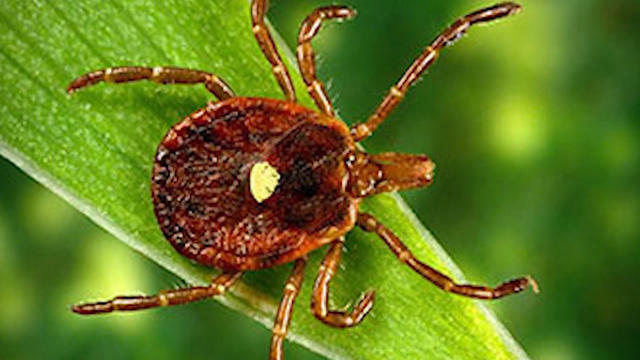 The spread of this and other ailments transmitted by ticks is only getting worse. Tick-borne illnesses alone have doubled in recent years, while those caused by mosquito, tick, and flea bites collectively have tripled in the U.S. since 2005. That includes a growing number of cases of Lyme disease, which is spread by blacklegged ticks. More than 30,000 cases of Lyme disease are confirmed nationwide each year, but studies suggest the actual number is closer to 300,000.